It was a great workout, one of those days when everything in the gym seemed to weigh only 20 pounds. You even strapped on some weight when you did pull-ups and dips. But two days later, your muscles ache, your joints throb and your back has more knots than a Boy Scout camp. What the hell happened? 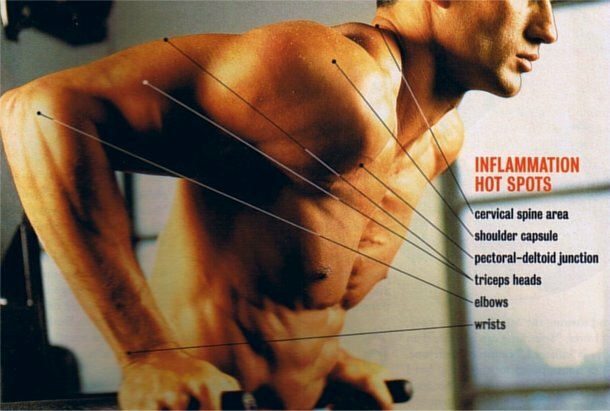 Often called delayed onset muscle soreness, or DOMS, this exercise-induced breakdown is believed to be the result of microscopic tearing Of the muscle fibers and the connective tissue that surrounds them (see “Hurts So Good,” March 2000). Your body interprets this as an inflammation, and initiates a series of events designed to combat it. The anti-inflammatory response involves bringing in extra fluid containing inflammation-fighting agents, which creates extra tension or pressure at the site. To stop one intense hour in the gym from reducing your next 48 hours to searing agony, follow the inflammation­fighting tips below. By combining hard workouts with smart nutritional and therapeutic moves, you can make muscular gains without the pain. 1. Warm up beforehand. Too many people start pushing iron without letting their bodies make the transition from easy char to bench press. "Warming up slowly raises the heart rate and body temperature," says Maffetone, thereby making the muscles and connective tissue more pliable and supple. A good warm-up can be a mere five to 10 minutes of walking or stationary biking. 2. Stretch. Ideally, this should be done before and after working out. "During or after a workout, a muscle is shorter than it's normal [natural] length," notes Tudor Bompa, Ph.D., a strength training expert and author.